Left to right: Rhonda Hughes, Teruo Kurosaki, Liz Crain. Right before the party started. Kanpai! Wow. What a party. 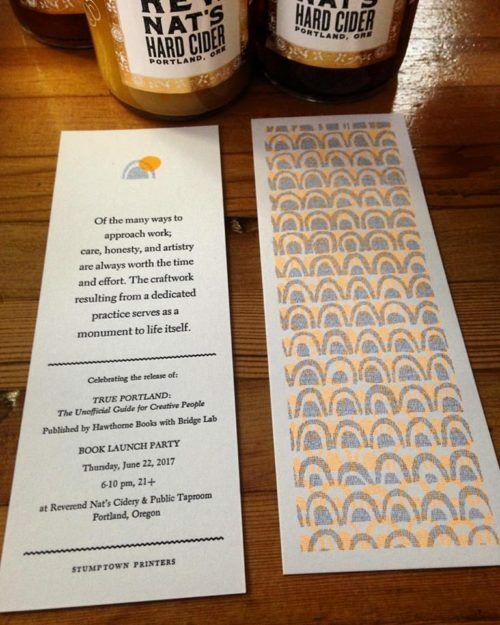 Thank you so much to everyone who came out for our Hawthorne Books + Media Surf/Bridge Lab + Reverent Nat's Hard CiderTrue Portland: The Unofficial Guide for Creative People book launch party last Thursday night. 500+ people came out and raised their glasses (filled with Nat's delicious Magnificent 7 made with seven Japanese apple varieties from Kiyokawa Family Orchards, Culmination Brewing's dry-hopped yuzu sour +++) with us including Teruo Kurosaki and his Japan posse, all of whom crossed the great Pacific from Tokyo to Portland for the party. Sure, we got some great coverage for the party including this and this but mostly I think we can attribute the awesome attendance to the combined sparkling, lovely, wild and creative greatness of everyone who participated including our super talented food/drink/wares vendors (all in the photos and linked up below), Reverend Nat's Hard Cider's Mr. Nat West and event coordinator Carolyn Winkler +++, the 400+ wise ones and businesses featured in the book and, of course, Hawthorne Books' Rhonda Hughes and moi. I have been lucky to be an editor and publicity director at Hawthorne Books since 2009. My boyfriend DJ Jimbo played so many sweet summery tunes for us including one of my favorites (and Lola's of Umi Organic) Strawberry Letter 23 written by Shuggie Otis and largely popularized by this The Brothers Johnson rendition of it. Hawthorne Books interns Stephen Hyde and Melina Hughes were hosts with the most at the Hawthorne Books table. (I stacked the books like a mountain pre-party and by the end the mountain was just about gone!) And the Travel Portland folks (hugely supportive of all editions of True Portland) came out and brought a lot of fun including their sasquatch-like Dude-head Japan mascot. You'll see. I managed to snap a bunch of photos throughout the night and many of them are below. You can also check the hashtag #trueportland on social media to see more. Oh, and, if you want to get a copy of the book head to your favorite independent bookseller and purchase it. Some businesses that we love who are carrying it include Powell's Books, Broadway Books, Monograph Bookwerks and Tender Loving Empire. It's easy to find now that it has launched. Thank you again to all of you and to Portland for celebrating True Portland with us. One of my favorite parties yet in all of my 40 years. So fun. Mount Fuji-sized stack of True Portland! Katsu Tanaka and Oleya of Kiriko Made. Their fabrics are incredibly beautiful. Can’t wait to get some. 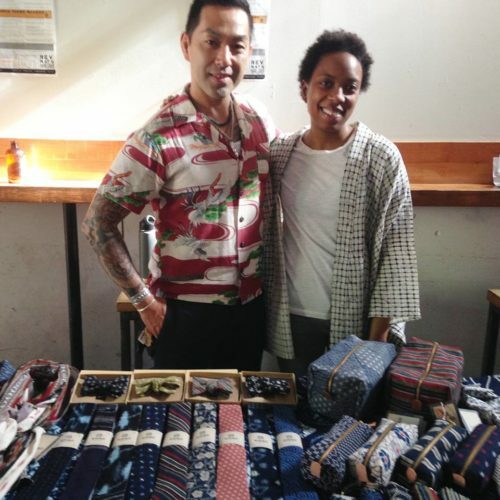 Here are links to all of the lovely vendors who took place in our party's Japan marketplace: Biwa/Noraneko/Parasol, Marukin Ramen, Yume Confections, Jorinji Miso, Kiriko Made, Wanpaku Natto, Seisuke Knife, Obon PDX and Umi Organic. Partyyyyyy! Really fun to have it in the heart of the cidery amongst all of the fermentation tanks. Seisuke Knife. Check out their shop. So many beautifully crafted Japanese knives. They regularly host Japanese bladesmith’s at their Northeast Portland shop. Chef Mayumi Hijikata of Marukin Ramen serving up their DELICIOUS cold ramen. So lovely on such a hot summer day/night. Rev. 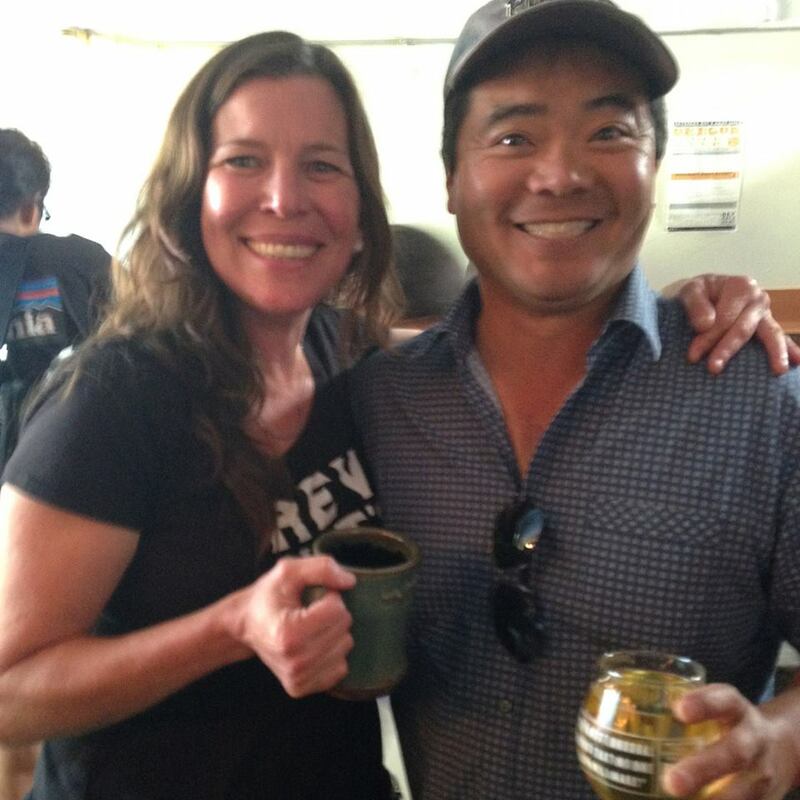 Nat’s event coordinator superstar Carolyn Winkler with Randy Kiyokawa of Kiyokawa Family Orchards in Parkdale. Seven Japanese varieties of his apples comprise Nat’s super tasty Magnificent 7 hard cider along with sake yeast that was poured at the event and is available in Japan. Party lovelies! 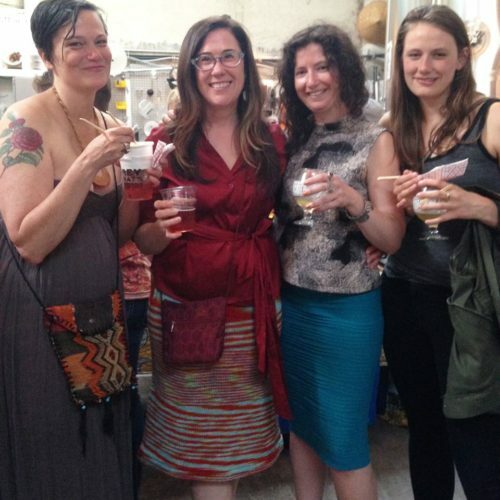 Left to right: Sarah Hart, Dory Athey, Rhonda Hughes, Alisha Gorder. We were all so lucky to get to sip on the rare (most of it has shipped to Japan) Rev. Nat Magnificent 7 cider. Link to it is above. Sooooo yummy and special. The hugely talented and dedicated folks at Stumptown Printers (featured in the book) made us these (out of the goodness of their hearts) beautiful commemorative cards for the event. Everyone who bought a book got one of these — three color, entirely analog, 100% recycled paper board, 2-color offset litho using hand-cut rubylith and 1-color letterpress linotype. My fine fellow DJ Jimbo made the night so fun with all of his great vinyl. He mixed in several rad Japanese songs that our friend Takeshi gave him just for the party. 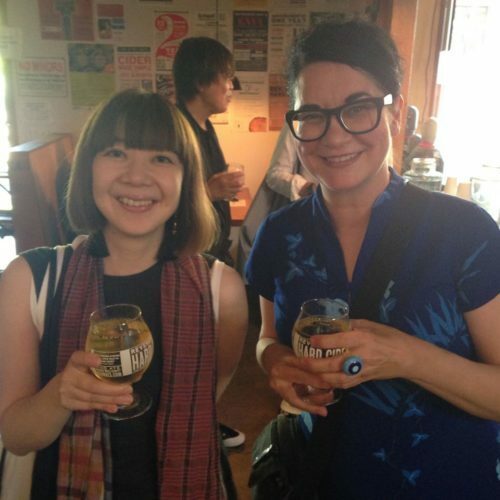 Yuri Migaki (left) and Lola Milholland of Jorinji Miso and Umi Organic. They partnered up (no photos of Earnest sadly!) 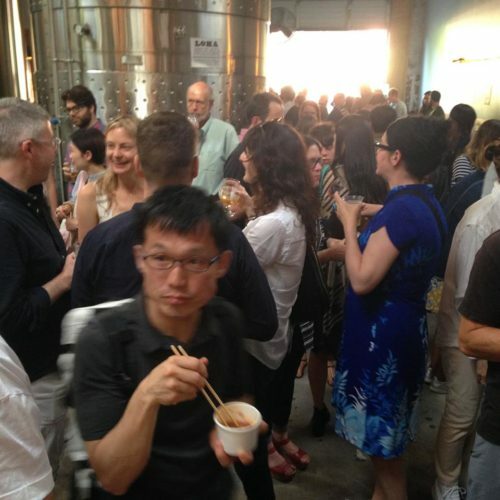 and served up really tasty noodle + miso dishes. Jorinji’s classic and delicious hiyashi chuka made with their miso, Lola’s Umi Organic ramen noodles and summer veggies. And Lola’s super tasty Umi Organic ramen noodles with Jorinji’s Goma Miso Sauce and crisp fresh veg. So good. 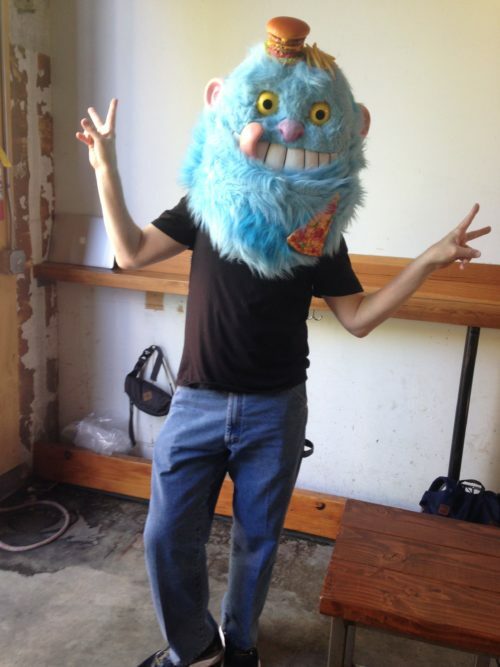 Jeff Hammerly of Travel Portland putting on their Japan mascot dudehead. I love Travel Portland. Jeff Hammerly all Duded up. Heidi’s super yummy natto. I don’t love natto but I do love hers. It’s much milder and more balanced in flavor than most. I went back for seconds. Hawthorne Books interns Stephen Hyde and Melina Hughes slinging books. Cheers to these two and True Portland! 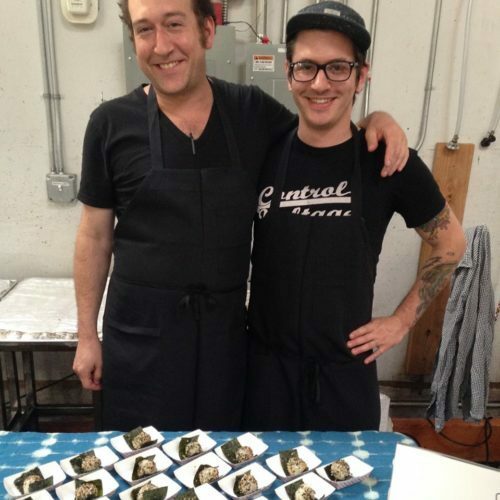 Gabe Rosen and Ian of Biwa/Noraneko/Parasol. Their onigiri was awesome! Me and Etsuyo Okajima — my Tokyo friend and one of the editors of the Japanese editions of True Portland. Happy. Etsuyo and Joy Church — executive director of The Portland Kitchen. If you don’t know of the great work that TPK does with underserved youth and the culinary arts check them out. The Rev. Nat Beers Made By Walking CIDER that launched that night. Wood shavings in the tea bag for flavor. My dear friends George Winborn of Metro and Michelle Gilmore of SMART. Fumiko Hozumi and Jason Duffany of Obon PDX. I had never had their food before and it was so yummy! Will definitely be checking them out and you should too — obonpdx.com. The cidery’s awesome taplist for the party. My favorite cidery on the planet. Sarah Hart, Rhonda Hughes, me and Dory Athey. Good times were had. I got my chance with the Travel Portland Japan mascot Dudehead. And the closing shot goes to the True Portland super talented book designer Shinpei Onishi. Traveling all the way from Tokyo to Portland will do this to you ;).